I don't know, it doesn't look like $110 worth of groceries to me, but then again, I rarely buy Name Brands of anything, so maybe I'm way off base. Interested in seeing what others think. well, I wasn't really asking if it looked like $110 worth... 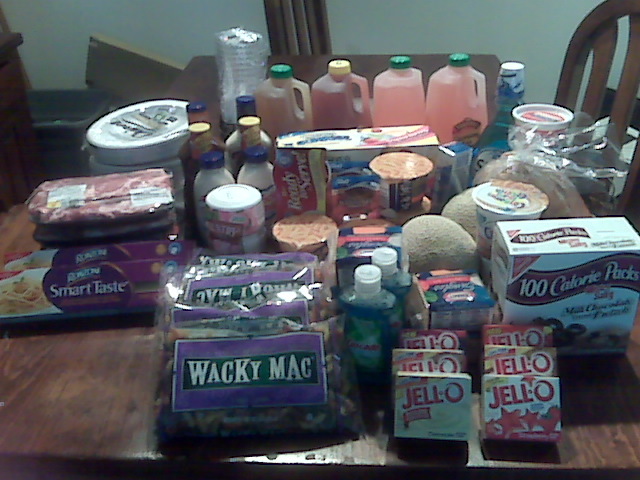 I was being happy b/c of how much I paid for all of it. I thought the folks in the forum would get that. Congratulations. Feels good doesn't it? Woo hoo. That is awesome. I love a great deal at the grocery store. Unfortunately the one grocery store that does double and triple coupons is also the most expensive to begin with. But every once in a while they will run buy 2 get "3" for free. Now those are great deals. So happy for you. Now with the savings you might think about getting your printer fixed, lol. Thanks you guys. It does feel awesome. I've never saved THAT much before. Lisa, it's not that it's broken, but for some reason, the printer isn't compatible w/ the coupons.com installation that you have to use. we've tried 3 different computers and it won't work. Coupons and sales are only good when they are for something you normally use and would buy anyway. If they make you consume something that you don't need, regardless of how much you "save", you really lose. This also points out the problem with coupons - with the exception of meat, spaghetti, cantaloupe, sour cream and toothpaste, everything on that list is packaged, processed junk that I don't buy. For the things I consider staples it's hard to find coupons, except for some store coupons: unprocessed rice, quality pasta, dried beans, fresh fruit, fresh veggies, flour, local, organic meats and eggs. well, I guess that if I could afford to be more snobby about what I buy, I'd go for that. But with 1 small child, a tween, a 6'1" 14 year old, a 6' 14 year old (depending on if my step son is with us), 2 adults and a budget of $400/month for food, toiletries, laundry soap, etc., then I'll take what I can get that's relatively good for them, fills them up and make sure I still come out ahead.